Les documents fournis sont sous la responsabilité de leurs auteurs, et ne représentent pas nécessairement les positions officielles de l'École polytechnique. Les informations données le sont de bonne foi, mais leur véracité ne saurait être garantie. Adress: LIX, Ecole Polytechnique, 91128 Palaiseau Cedex, France. the unreasonable persists in trying to adapt the world to himself. Therefore all progress depends on the unreasonable". INF 542, Th�orie des automates, langages formels, calculabilit�, senior level. INF 551, voir aussi ici, Conception et analyse des algorithmes, senior level. Graduate course on Approximation Algorithms and Testing in DEA Algo (see slides of presentation). Research area : approximation algorithms, combinatorial optimization, probabilistic analysis of algorithms. Current and former PhD students : Nicolas Schabanel, Jeremy Barbay, Veronique Unger. French association on Theoretical computer science, AFIT. See here for a proposed explanation of why in computer science people publish more often in conferences than in journals. ESAIM: P&S: Journal of the European Society of Applied and Industrial Mathematics, specialized in Probability and Statistics. ICALP 2002: 29-th International Colloquium on Automata, Languages, and Programming. SODA 2003: Fourteenth Annnual ACM-SIAM Symposium on Discrete Algorithms. FOCS 2002: The 43rd Annual IEEE Symposium on Foundations of Computer Science. STOC 2003: The 35th Annual ACM Symposium on Theory of Computing. FOCS 2003: The 44th Annual IEEE Symposium on Foundations of Computer Science. APPOL and APPOL 2, Approximation and on-line algorithms, European project, 2000-2001, 2001-2004. RAND 2 , ESPRIT European Working Group "Randomized Algorithms" 1996-2000 (4 ans). Bi-national CNRS-NSF cooperation grant with Georgia Tech., 2000-2002 (3 ans). 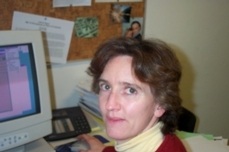 Bi-national research project France-Berkeley 1999, Phase transitions and complexity. National CNRS ASP Project on local search and approximation algorithms, "algorithmes d'approximation et de recherche locale". Program of the day of talks of 26 October 2000. National INRIA cooperative research action, AlCoPhys, Algorithmique, Combinatoire et Physique Statistique, Action de Recherche Cooperative INRIA, 1999-2001 (2 ans). `This is a rather unusual situation in physics. We perform approximate calculations which are valid only in some regime and this gives us the exact answer. This is a theorist's heaven- exact results with approximate methods'. National Interdisciplinary CNRS Research project, Physique Statistique et Optimisation Combinatoire, 1998. Local University of Paris-South Research project, BQR , 1999-2000 Algorithmique sur graphes et physique statistique : coupe maximale et verres de spins (1 an).